After a dry week, which we needed, last night we got a major storm complete with wild winds, continuous lightning, and 2.5” of hard rain. I checked the garden this morning and the corn which was standing 3’ tall is now lying horizontally 3’. I gave it a few hours of sun to see if it would straighten itself out or if was going to take several hours of manual labor. It wasn’t uprooted which was a good sign. In real life, I gave it about 4 hours and it was self correcting to some extent but I decided to expend a little sweat equity and speed up the process. So it’s vertical again. Planted 12 tomatoes, all doing well, making it through the first critical 24 hours; no cutworms or shocked plants. The fact that I took so much caution with the planting process tells me that my past failures have probably been self generated by the farmer. Also planted seeds directly in the garden for a second row of cuc’s, pole beans and a second zucchini plant. I actually think we’ll start picking cuc’s and zuc’s late this month if the weather holds reasonably on track. Started a few cabbage and kale seeds on the porch – a bit earlier than usual. Between what’s already planted in the garden and assuming these new seeds germinate and grow properly, by my count this nominally fills the garden 100% through November and December. I still have small areas for carrots, radishes, lettuce, and spinach spread around. I call these filler crops because they take very little room and can just be spot planted on a space available basis. Dodged a bullet in the garden last night. I went out this morning to do a daily check and noticed deer tracks all along the edge of the trellis, right next to the pole beans and the cucumbers. I also noticed that a small jalapeno pepper plant had been yanked out of the ground but nothing else seems to have been disturbed. I’m guessing that the first think he came to was the pepper plant and when he took a chomp on that, he wasn’t interested in dining any further. Simon called to give us a Coosa River update. He’s getting a high intensity 3 week training session to prepare him to be an instructor for the upcoming season. The highlight so far is the raptor handling sessions. He started with a screech owl but will graduate to handling a bald eagle. He’s also learning to handle the “herps” – and has been assigned to be the primary caregiver for a leopard gecko. How is it possible that the pres calls a press conference to announce that he doesn’t have a strategy for dealing with ISIS? Doesn’t have a strategy, not that he can’t discuss the strategy for security reasons but that he doesn’t have one. Certainly there’s a strategy – it’s to do nothing. That’s ok but he’s ashamed to just come out and say it – as he should be. Or else the strategy is to lull the bad guys into a false sense of security by making them think we’re floundering around with a clueless administration at the helm but we really do plan to do something. Now I know how the French must feel with an embarrassing foreign policy. But they’re used to it by now whereas this is all new to us. I can just visualize Obama, Hagel, and Kerry sitting around the table looking at each other with dazed looks on their faces wondering how they got into this s— storm. A bit of a strategy is forming though – the pres sent Kerry off to Qatar, Jordan, and Lebanon to get them to help. GADS!!!! The UK raised their threat level and Obama says that’s not necessary and I suspect he’s right but can you imagine the backlash if some nut case Jihadist shoots somebody at a shopping mall. Not to worry, we’ve got a strategy for putting up windmills/eagle choppers so for sure he’ll have something to tilt in the future. All the moves are done. Chris is in Chicago; Simon is in Alabama; Olivia is tucked away in a dorm on campus at UCF. All came through without a hitch. The picture shows the water ballet show at the dock this weekend. This was a big week in the garden. I spotted blossoms on the zucchini plant and climbing tendrils popped out on the cucumbers. All of that was fairly well on schedule and the plants seem to be handling the August heat and humidity just fine. But the big thing was I planted the first four tomato plants; two standard sandwich tomatoes and two Roma, paste style. I had five of each plus some cherries that were getting leggy in the flat – ready, I think, for the garden. This is a big step in terms of their surviving so I did the small planting first and will make sure these survive for a couple of days before planting more. I did the full treatment – meaning digging a 12” x 12” x12” hole, filling it with compost then transplanted the seedling. I then installed a cardboard collar around the stem of each plant to protect them from the feared and dreaded cutworms. Cutworms are horrible creatures that must live dormant in the soil until they sense a tomato has been planted. Then they emerge at night and gnaw the stem through so when you come out in the morning you find the plant laying over separated right at ground level. In the past if I plant 10, chances are 2 will be gone the first night. The collars work but I usually am either too lazy or forget that step. Not this year – no short cuts. I’ll give these plants 2-3 days and if they survive, I’ll transplant another 8-10. I’m pretty sure I have enough compost to do the job but it’ll be close. Also, I planted these in rows that I’ve kept completely weed free and baking in the sun for 2 months so if I have nematode problems this time, I’m back to zero thoughts about how to control them. I didn’t use my sugar/clorox treatment because there were so many earth worms in the soil, I didn’t want to risk killing them along with the nematodes. A few months back Tom was here and happened to mention that he had personally replaced the ice maker in his refrigerator. Ours has been acting up for a fair while now and Nancy figured that if Tom could fix his, I could fix ours. Both of us are slightly challenged when it comes to home repairs. The problem with the ice maker was that every once in a while, it must have been dripping water which caused the cubes to freeze together. Personally I could live with that problem for years especially knowing that a service call would end up being $250 and also knowing that you can still buy ice trays at the dollar store. Nancy was not deterred and, unbeknownst to me, ordered the replacement part online for $65 – about the same as 65 ice trays. There were a few hitches in the getalong but I had the replacement installed in about an hour and even had all the tools required so no emergency trip to the hardware store. According to the directions, it can take up to 24 hours for the first ice to form. It took 2. So from start to finish including making a batch of cubes, 3 hours. Overnight, the receiving tray was full of cubes. Mission Accomplished. On my recent visit to the Doc for an annual check-up, he mentioned my BMI showed I was “slightly overweight” but not to worry. I told him I thought I was not overweight and that his measurement was off because he used the fully clothed weight but not the fully clothed height. That threw him off his game. I said that if he was going to use my fully clothed weight in the calculation, then he should use my height with shoes and socks. Believe it or not, he challenged my calculation and was surprised to see what difference a 2 pound pair of shoes with a 1” elevation mattered. I went (on paper) from overweight to just fine. Olivia joined a sorority, ADP. I thought ADP was a 50‘s data processing company but I guess they expanded out into the sorority business somewhere along the line. So at this point she’s 100% committed between a freshman college load, an off campus job, and a sorority. I think she’ll make it all work. Simon decided to just hole up on Sunday, enjoy the river camp and recover from an overload of sun, mosquitoes, and sore arms. Then on Monday he put on the last 5 miles to Lafayette Blue Springs where Tina picked him up. All in all a successful trip since it ended up with a pledge to do the lower half next year – from Lafayette Blue Springs on down to the Gulf. On Friday he headed up to the Coosa River Science Center for his next wilderness gig. The pole beans I planted the first of August are already 5 feet long with tendrils climbing up the trellis, more than halfway to the top. No matter how many times I experience this growth, it still always blows me away. The plan is to put in a second batch the first of September. The cucumbers planted the same time are adding leaves but are way too short to reach the trellis. I’ll plant the second batch of those also on the first. So with any luck with respect to the weather, we should be set with both crops until near Christmas. We’ve got a few wild guava trees in the jungle. My neighbor planted some years ago and the birds, squirrels or whatever have dropped seeds hither and yon so between us we get a pretty good crop. A few days ago Barbara knocked on the door and asked if we minded if she picked the ones in our jungle. No problem. Today, as if by magic, a few jars of guava jelly showed up. She said they will take a few days to set up but I could notice a big difference in just 12 hours. 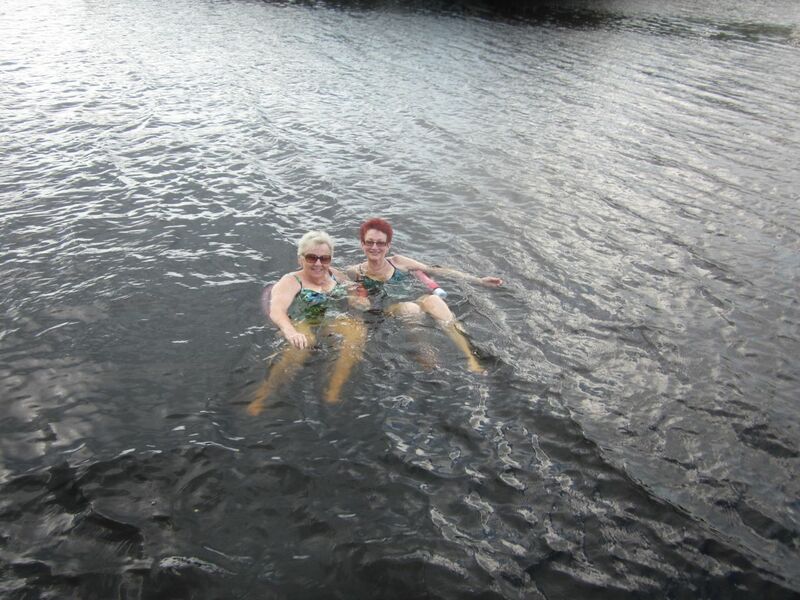 Joanne was in need of some lake time so she joined us this weekend. We (she and I) did a cheese and wine social (sans cheese) on the dock Saturday evening. It was even nice enough to rain and storm a little while we were out there. So a journalist gets his head chopped off by bad guys in Iraq and we have a Chicago community organizer in charge of responding (or not). I can see where he would feel more at home when an unarmed thug gets shot by a cop for resisting arrest and the local merchants are looted. Send in Al Sharpton and Eric Holder after a week of rioting. I think Big Al and Eric should be sent to Iraq to protest the activities there. Do a little community organizing maybe. If you’re interested in seeing Simon’s kayak trip, check out this site- http://www.floridastateparks.org/wilderness/Maps.cfm. He started on the upper right side of the map, White Springs, the green triangle, and made it to Woods Ferry River Camp, the green square just to the left of White Springs. To calibrate you, that’s about 9 river miles. He spent about 6 hours on the river but was doing as much drifting as paddling. On Day 2 he picked up the pace and made it to Holton Creek River Camp, the second green square, about 19 miles. The day included a stop at the second triangle on the map, Spirit of the Suwannee Music Park. He said he felt just fine at the end of day 2, not sore at all. If I had gone and slept overnight on a hard floor and then paddled a kayak for 8 hours, you’d have had to carry me the rest of the way. Day 3, Suwannee River State Park, 17 miles downstream so by my crude reckoning, he’s logged 45 miles so far. Last night he ate beef stroganoff; tonight mashed potatoes made from powdered potatoes. I think tomorrow night’s destination is the Troy Springs River Camp. He said he’s still feeling great, a little arm weary but not too much. Ran into his first gator today, a six footer and also a small herd of deer. Day 4 and another 15 miles. He’s spending Saturday night at Dowling park. He sounded tired on this leg and may cut the whole thing short a day. I’m guessing after a good night’s sleep, he’ll stick it out the way he originally planned it. The adventure today was a stretch of the river that was loaded with leaping sturgeon. These are really monstrous fish and he said he could hear lots of splashing ahead and wondered what was going on. He rounded a bend and there was a stretch where they were leaping 3’ out of the water and belly flopping back. These guys can weigh over 100 pounds so if one landed on the boat, it would be a day to remember. And another gator. Saw something awesome today. I’ve mentioned the family of turkeys that I spot on an off. Well today when I rounded the corner towards the mail and newspaper box, there was an adult turkey and 6-8 half size ones. I stopped and they slowly walked onto my neighbors property where I spotted another 6-8 smaller ones merging into my original group. Then another cluster appeared so I estimate there were close to 20 of these half size turkeys and one adult. I went back to the house, called my neighbor and he went up to take a look. He confirmed they were there and said the small ones were called “jakes”. I’d never heard that term and I’ve never seen such a large cluster. I guess when they grow to a certain size they leave the small family and cluster into groups of teenagers or tweens. Neat. I see so many different things on my morning walk to get the paper that I really should get in the habit of carrying my camera. Here’s another garden factoid that you probably never find useful – it takes 2 months for corn stalks to decompose into useable compost. I cut down a whole, 6’ tall stalk and then cut it into pieces about 8” and pitch them into a compost pile. The thinking around me is that it will “never” decompose or never in any reasonable time. Fact is that I’ll be using it the end of this month; so less than 3 months. That’s just about when I need it for transplanting tomatoes into the garden. For each tomato plant I dig a 1 CF hole and fill it with fresh, newly made compost. The soil that I dig out of the hole goes to raise the level of the row, improving overall drainage. This time of the year that’s a big deal and a plant saver. 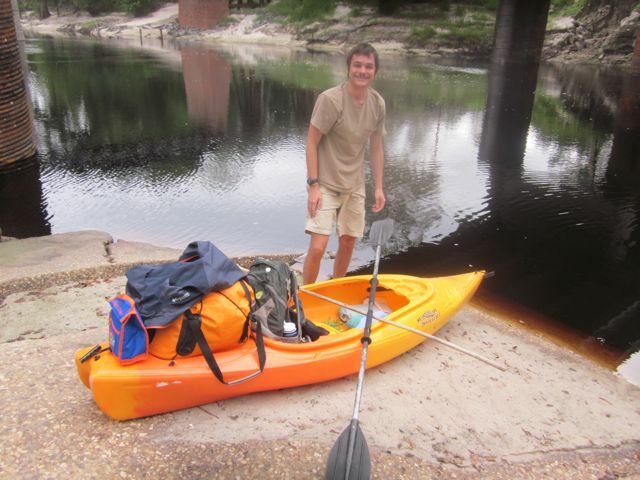 Simon is off on an adventure I’ve always wanted to do – kayaking the Suwannee River – that’s Suwannee as in “Way down upon the Suwannee River”. I drove him up Wednesday to a put in spot north of Gainesville, Stephen Foster State Park, and Tina will pick him up on Sunday down stream at Troy Springs, a paddle on the order of 60 miles. There are strategically placed primitive camp grounds or full fledged state parks along the river so he’ll be semi roughing it. I’d love to go but that long in a kayak would kill me. I can do about 2 hours before my back cramps up. Tom and I talked and we’re not as experienced (or tough) as he is with respect to really roughing it – sleeping on the ground or hanging in a hammock or whipping up a meal from dried beans. Our camping has always been closer to a motel in terms of creature comforts. Last minute update – he called this evening and made it to the first river camp just fine. It was about a 10 mile run and he said he just drifted much of it and checked out the wildlife. He got underway about 10:45AM and was in the cabin by 6PM. The cabin is a single room, screened, roofed, platform that would sleep about 5 people. He’s the only customer tonight and used hooks in the wall to hang his hammock. There’s electricity and running water at each cabin (I think he said there were 5 cabins) and a community hot shower. He made pasta for din din. I’m done worrying – he has it totally under control. I took a walk on the wild side. Some guys ride motorcycles, some guys sky dive, some guys swim with great whites. I planted lettuce in the garden in the summer. I must be an adrenaline junkie. Actually I’ve been lucky so far with light rain for the first couple of days which kept the temp below 90. All of the tomato seeds I planted have germinated and I’m starting to transplant them into flats for my “customers”. Ditto the broccoli. I’ve been worried about the corn drifting away but so far, it seems to be thriving in the wet soil. Sure ready for this rain to stop. We seem to be averaging an inch each day, mostly light, but mostly constant. The lake has reached a peak such that adding rain temporarily raises the lake but within a few hours it recedes to the peak-so the lake must be draining at the north end. There’s another lake a few hundred yards to the north which in turn drains into a large lake, Disston, to the north and west. These drain areas are normally high and dry but must be all connected into one large water system now. We had a major rain the other day – 2” in about 30 minutes. Lighting, hail, and big wind accompanied the rain so it was a serious storm. When it was over I went to the garden or should I say the pond. Not sure what long term impact that will have but the bottom 1/4 of George’s property, down by the lake, is now looking like a pond itself. Maybe I should be growing rice instead of corn. But that isn’t the real disaster. For years there’s been a large pine tree down by the lake tilting over. 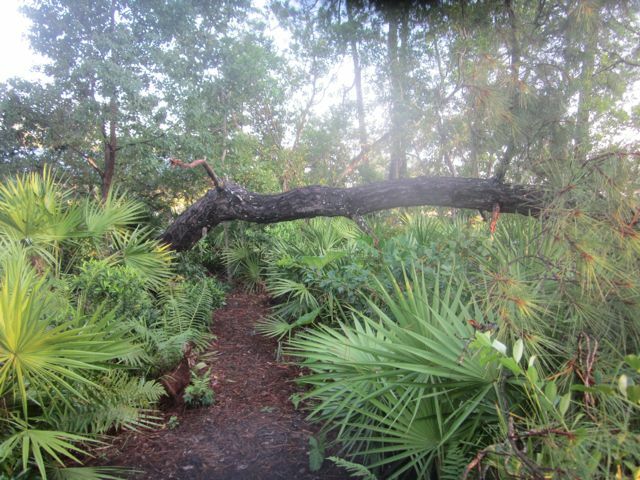 No more – it crashed and created a natural bridge over the path. It took several trees and large branches with it so I’ve got a real mess on my hands. If it was just that, I could live with it but when I went up to get the paper and mail I found that the bear had broken into my shed, pulled out the garbage can and dumped it on the driveway. 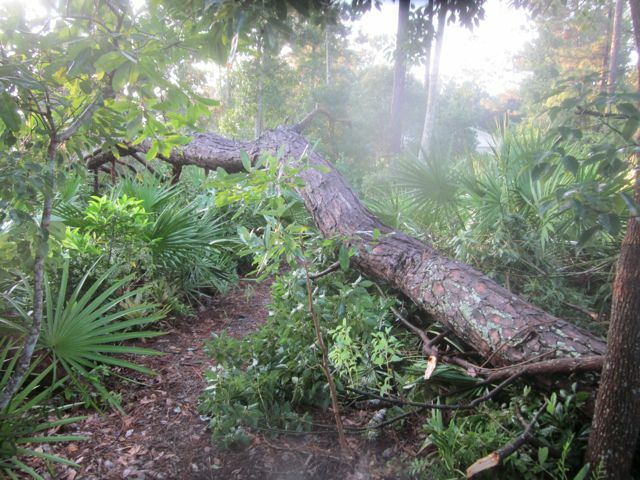 Cleaned that up and continued up the driveway only to find my way blocked by a large, 4” diameter, branch which had come down in the storm. That size is quite manageable with my wimpy chain saw. Remember those Muck Boots Nancy got me a few months back, the real heavy ones that were killing my legs. Well those have turned out to be perfect under these wet conditions. No wet sneakers to contend with. This week Nancy moved her bridge operation from Palm Coast to Tomoka on Tuesday and to Flagler on Friday so I moved my tagalong surf fishing operation to Ormond Beach and Flagler Beach respectively. I found a quiet stretch about 5 miles north of Ormond by the Sea and caught 3 fish – none worth much but kept me amused anyway. At Flagler I fished just south of Gamble Rogers State Park, a stretch I’ve fished several times before with reasonable results. This time nothing but plenty of sun. It was fun but the tides were wrong or something. One thing I saw was a guy flying one of those 4 prop camera drones. That’s the first one I’ve seen up close and personal – very neat. The Edwards’, Megan, Brandon, and Allie, spent the weekend with us and it was really fun. It was Allie’s first swim in a lake and she was not the least bit shy hopping in and wasn’t too happy about getting out. It was also Brandon’s first visit to the lake but I’m betting it won’t be the last. He’s into swimming and kayaking and we’re long on both so I’m guessing their next visit will extend for a few days. They didn’t realize how close to the beach we are, about 30 minutes, so the next trip has to include some beach time. On Sunday afternoon I planted the other seeds for the fall crop – the tomatoes etc. I plant these in special seed starting soil in small styrofoam cups and usually keep them indoors in an air conditioned environment until they’ve germinated and put on enough leaves for transplant to individual containers and eventually outside. I have a grow light so they have adequate light for growth. I decided to do it a little differently this year and keep these seeds outside on the back porch-a warmer, more humid environment than usual. I checked on them first thing Tuesday morning and much of the lettuce, 2 varieties, and the broccoli had germinated. That’s way faster than I’ve typically experienced. Don’t know if that’s good or bad long term. The tomatoes made their first appearance on Wednesday. The interesting thing about that is I planted 6 different varieties at the same time, 2 different cherries, 2 different plums, and 2 different rounds and all germinated within hours of each other. I mentioned how fast the corn seed germinated. I checked on the other seeds planted directly in the garden and found that both cucumbers and zucchini had popped out a day after the corn. The next day the green beans and cantaloupe made their appearance so it’s all good. No doubt the soil is warmer in August than in March when I usually plant directly into the garden and that must be accelerating the germination beyond what I had expected. Another possibility for Simon, the COOSA River Science School at the Alabama 4-H center near Columbiana, just south of Birmingham. All of these places look good to me and I suspect the bass fishing at this one will be excellent. Something should break in the next week or two since all of them will be up and running for the Fall season toward the end of this month.